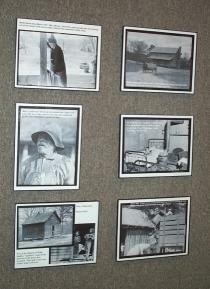 The special display at the Spartanburg Regional Museum of History. 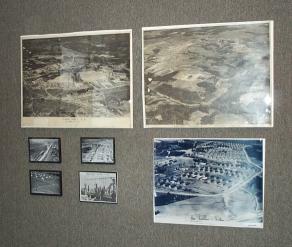 Camp's opening and ran from April 6 to May 26, 2001. 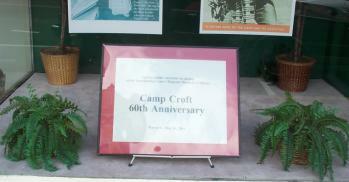 The outside window display of the Regional Museum of History reminds visitors and passers-by of the special 60th Anniversary Camp Croft exhibit. 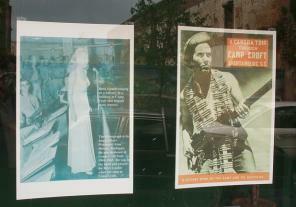 Also in the window, Betty Grable performing in the Croft Service Club and the cover of a publication called "A Camera Trip Though Camp Croft ..."
G.I. 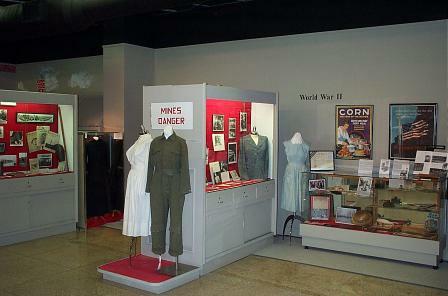 equipment including a pistol belt,. 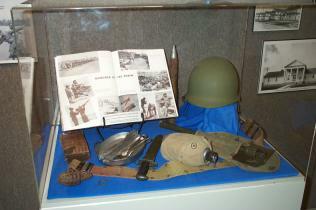 canteen and cover, bayonet, entrenching tool, mess tin (meat can), practice grenade, helmet liner, and 1942 yearbook style publication of the 50th ITB. 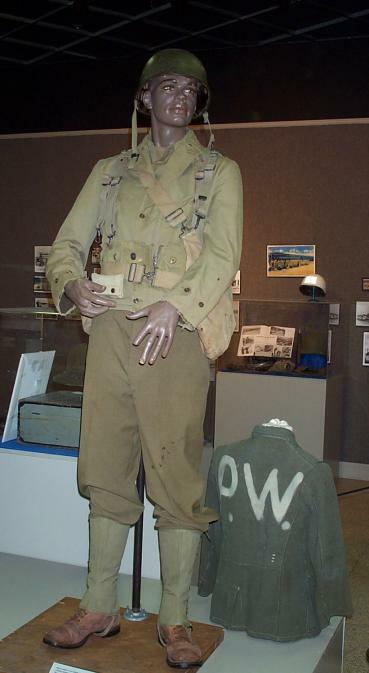 One mannequin portrays and early war trainee with blue denim fatigues, M1917 helmet, gas mask, and web equipment. 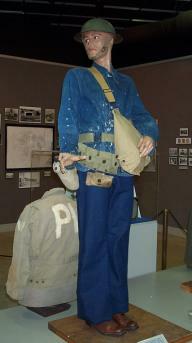 The second mannequin is equipped as later war with similar equipment. 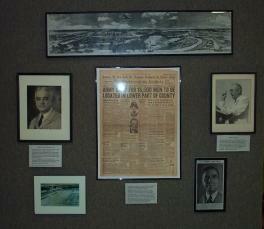 Note the "P.W." jackets behind them. 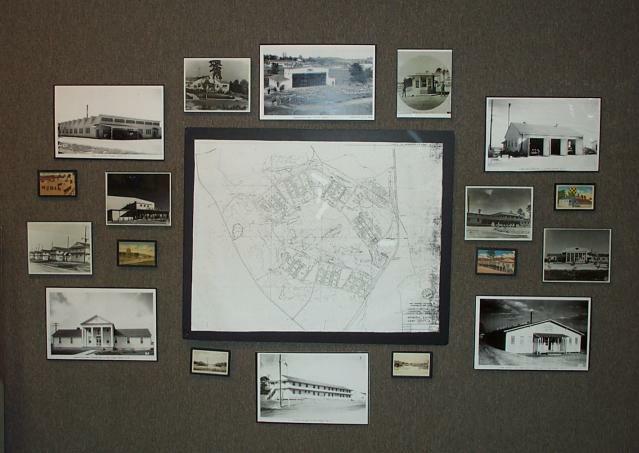 These were issued to German POWs housed at Croft and other locations throughout the South East. 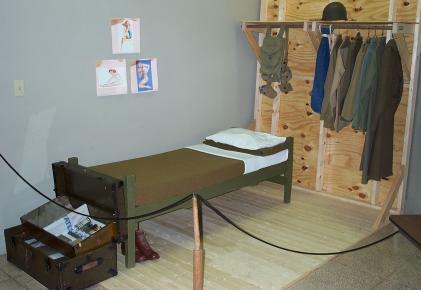 The first is a re-issued US M1941 jacket and the other is a German tunic. 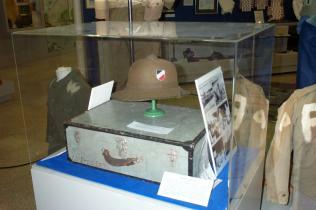 The suitcase of a German POW detained at Croft. The suitcase was found in a nearby home after the war, the owner was located in the 1970's, and he was able to confirm ownership! 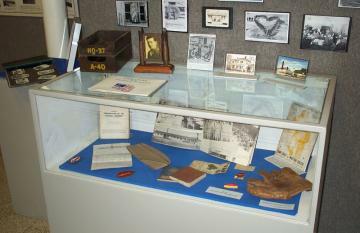 Many souvenir items were available at the Post Exchange and in nearby shops. 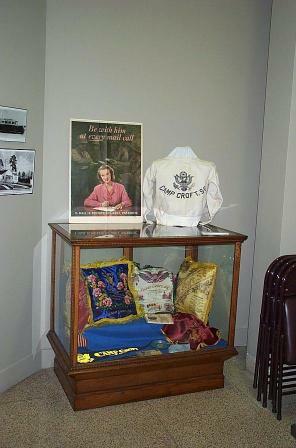 This case holds several satin pillow covers and a like new sweatshirt. 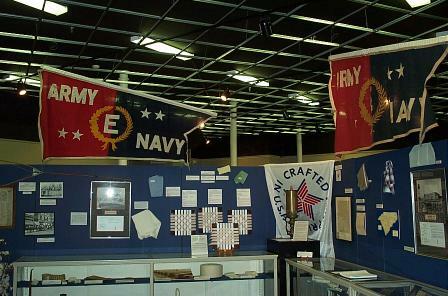 The coveted "E Flag" was awarded to mills and other industries that met particular criteria and quotas for war materials. 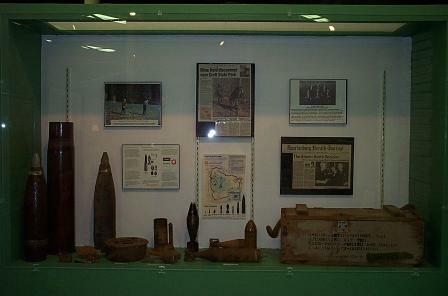 Ordnance found at Croft, newspaper clippings of the on going clean up efforts, an article about how the Hiroshima and Nagasaki bombings were planned at Secretary of War James F. Byrnes home in Spartanburg, and a Wofford college photo of Nazi propagandist Robert H. Best, a Spartanburg county native who broadcast his radio program from Berlin.